Out of a hailstorm of machine gun fire and heavy shelling, Pvt. Burton Holmes returned, badly wounded, to the 371st Infantry Regiment’s command post. 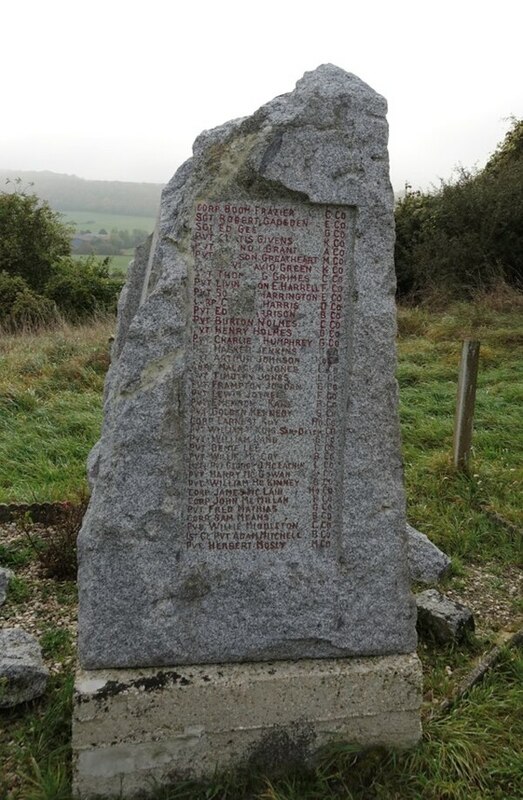 His unit had been set up, lured out onto Hill 188 by the false promise of surrender, leaving them vulnerable to the surprise attack from the Germans. But Holmes returned only because his automatic rifle was out of commission. He refused to be taken to the hospital for treatment. Instead, he got a reserve automatic rifle and rejoined the fight, firing upon the enemy until he died. His try-or-die attitude was shared by all of Company C. His fellow soldier, Cpl. Freddie Stowers, continued to crawl ahead after being mortally wounded. He, too, died under fire, while encouraging the unit to continue advancing. For their actions in the Battle of Hill 188, on Sept. 28, 1918, both Holmes and Stowers were recommended for the Medal of Honor. 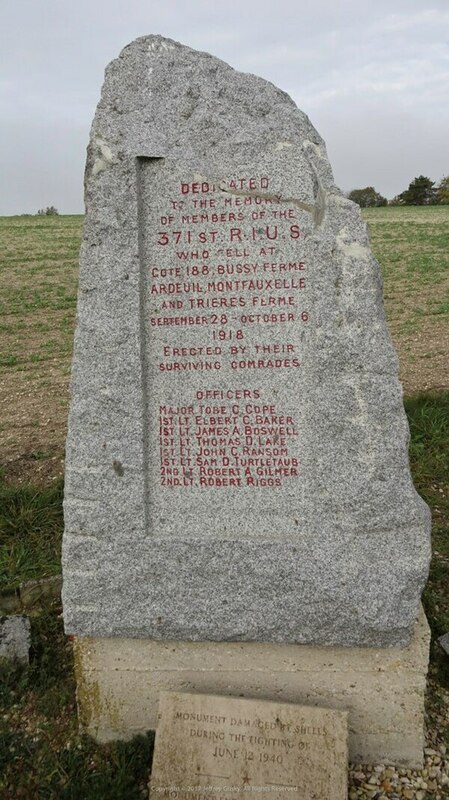 Part of the monument dedicated to fallen members of the 371st Division in the Champagne hillside. Holmes, 13 down. Photo credit: Jeff Gusky. It’s a special case, according to Dr. Jeff Gusky, ER doctor and National Geographic photographer. 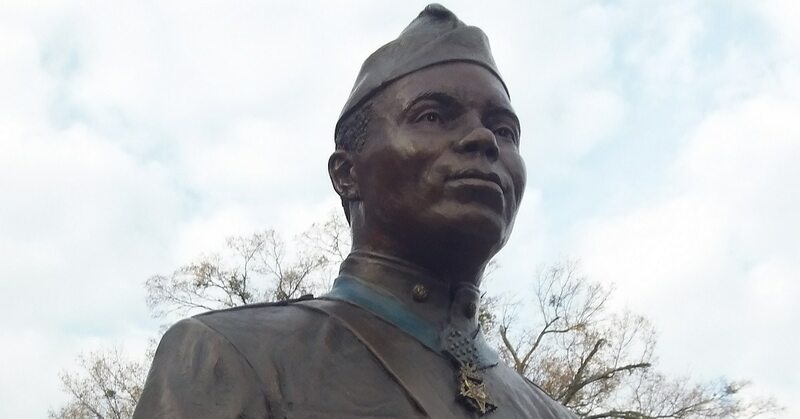 It is, as far as he can tell, the only case in U.S. history in which two African Americans died in the same battle and were both considered for the Medal of Honor. 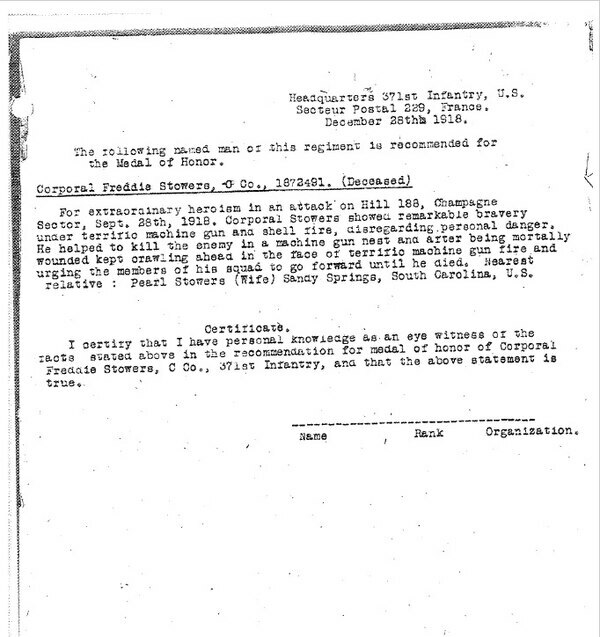 But neither recommendation was approved; Holmes’ award was downgraded to a Distinguished Service Cross and Stowers’ recommendation was lost for decades. Why? Gusky said it’s institutionalized and systematic racism. He is working with the American Legion and the American Battle Monuments Commission to get Holmes’ case reviewed. The 371st Infantry Regiment, which served with the French Command, was the most decorated combat unit of black soldiers in the U.S. Army during World War I.
Stowers’ recommendation was uncovered in the late 1980s and awarded posthumously to his family in 1991, making him the first black Medal of Honor recipient for World War I. If Stowers’ actions deserved the Medal of Honor, Gusky said, Holmes’ actions do, too. Was it racism, which arguably increased during WWI in response to the standards of equality set by the “color blind” French Command that the 371st served with? Perhaps, Gusky argues, Holmes was not awarded the Medal of Honor because it would challenge the status of Jim Crow laws. 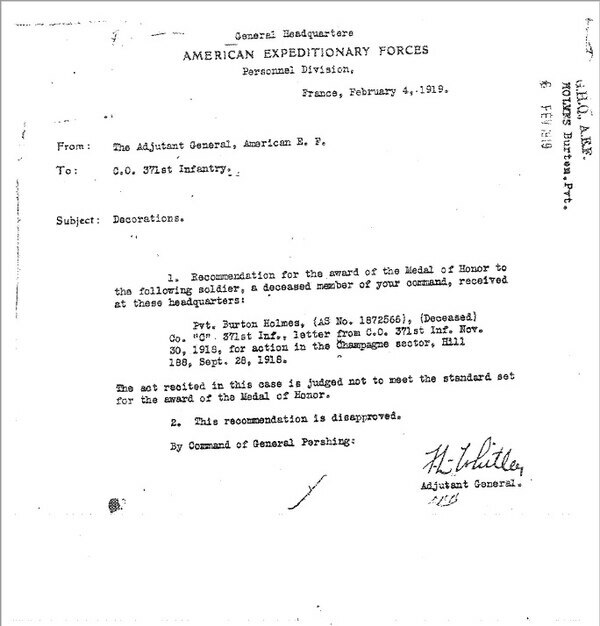 “That was actually Pershing’s policy,” said Gerald Torrence, director of Strategic Planning at AMBC, referring to Pershing’s secret memo: secret information sent to the French Command outlining how to “handle” black U.S. soldiers. “You don’t treat blacks with too much respect, you don’t give them compliments in front of white officers, you don’t treat them too well, because you don’t want them to come home and be disappointed,” Torrence said, referring to the policy. However, the team at AMBC says it’s a difficult argument to make, and still wants to conduct more research before bringing the case before the Army. 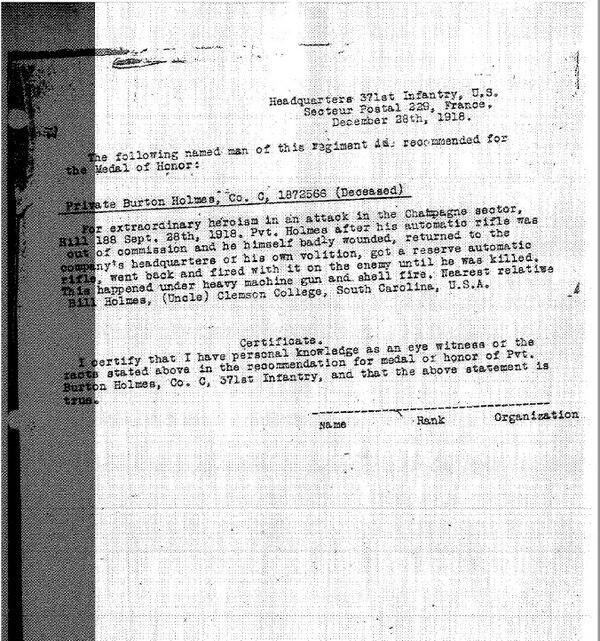 The recommendation could have been poorly written, and there was no one advocating for Holmes, a poor, illiterate cotton picker from rural South Carolina, drafted into the 371st Infantry Regiment, a newly formed unit within the segregated 93rd Division. An officer — a white officer, the only kind in the 371st — recommended him for the medal. Their next step would be approaching the Army, which would review the case and, if they agree that it should be upgraded, would take it to Congress. But it’s all conjecture, according to Knapp. Regardless of the reason, Jones says it’s a wrong that must be righted. Gusky and Jones have reached out to Sen. Tim Scott of South Carolina to advocate for Holmes in Congress. According to Gusky and Jones, Scott expressed his interest in the story and agreed to research it more. He did not respond to Military Times for comment. It may be difficult to achieve, but Gusky and advocates at the AMBC and American Legion believe the cause is important and the story is unifying.